From May of 2012 to February of 2016, I was a research assistant for the Carnegie Museum of Natural History in Pittsburgh. 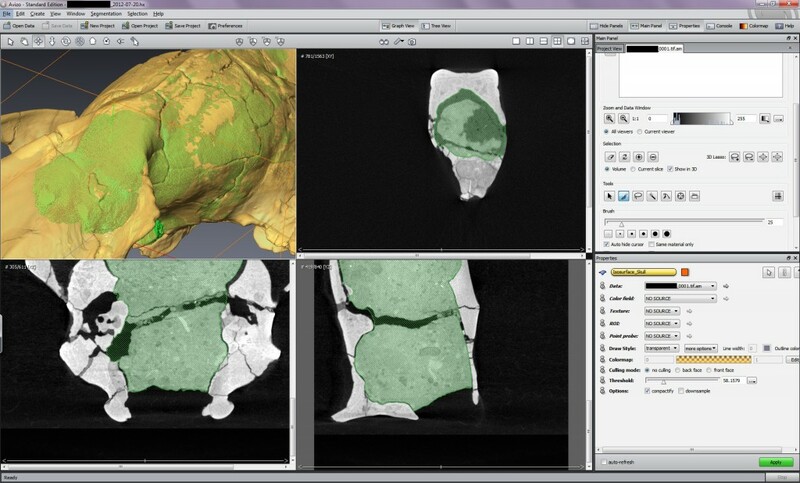 I used software called Avizo to segment CT scans of fossilized and living species of mammals. I worked with Dr. Michelle Spaulding (Purdue) and Dr. John Wible (CMNH). Specimens I worked on range in age from 155 million years old to living species with most being between 50 million and 30 million years old. With few exceptions all specimens are mammals, many of which are Carnivorans (cats and dogs) or Carnivoramorphans (possibly pre-cats and pre-dogs). During my time working in the Section of Mammals I have helped to shape how the museum view and organizes its digital collections. Careful curation has made all of the CT Data that we have easily accessible, even data that had for over a decade been hidden away on CD-ROMs. In my first few months I recommended the acquisition of a first generation Makerbot Replicator Dualstrude 3D printer. The results were unimpressive out of the box but with some tweaking of the slicing profiles in ReplicatorG I am now able to get highly detailed prints that impress even experienced Makerbot users. [slicing profile instructions were made public via Thingiverse]. In 2014 I advised an internal funding request for further 3D printing equipment. We purchased a fifth generation Makerbot Replicator as well as a NextEngine full color 3D laser scanner [with HD Pro upgrade and Multidrive 2 axis robotic arm]. I also advised hardware, software, and network upgrades to our workstation as well as the purchase of an additional workstation. I operate all of the 3D printing and scanning equipment. Further funding requests were submitted and I have ambitions to establish complete audio/video editing capabilities, full color 3D printing capabilities [in contact now with manufacturers for sample prints], and eventually the construction of an advanced imaging lab which would include a micro-CT scanner. An endocast is a cast of the endocranium (inside of the skull). The morphology of the brain and nerves leave imprints in the bone on the inside of the skull. A cast of these imprints can be used as an analogue for the size, shape and features of the brain. CT scans arrive has a stack of images, each image showing a slice of the scanned specimen. I tag the slices to show the features inside the skull. In addition to digital endocasts, I have also worked on ear ossicles, inner ear morphology, and the hyoid. Mammals have a unique three part ossicular chain that work like a finely tuned instrument to transmit sound to the cochlea where tiny fibers send signals to the brain through the cochlear nerve. Three bones called ossicles make up the ossicular chain: the malleus, incus, and stapes. Sound from outside the ear vibrates the tympanic membrane which is stretched across a bone called the ectotympanic. The malleus, the first bone in the ossicular chain, is attached to the backside of the tympanic membrane and is sensitive to its vibration. The incus, the second bone in the ossicular chain, is attached to the malleus and picks up its movement. A protrusion on the incus called the long process pushes the stapes, the third bone in the ossicular chain. The cochlea is completely contained within a bone called the petrosal. It is spiral shaped and wraps around the cochlear nerve. Fluid within the cochlea stimulates tiny fibers whose movement send electric pulses through the nerve to the brain. The stapes pushes against an opening in the petrosal called the oval window. As the stapes pushes against the oval window, it causes waves within the fluid inside the cochlea. Longer waves stimulate fibers in the larger part of the spiral of the cochlea. Shorter waves stimulate fibers further into the smaller parts of the cochlea. The different fibers provide different impulses through the cochlear nerve allowing for a broad range of sound to be distinguished. The petrosal has another opening next to the oval window the provide pressure relief for the cochlea. The petrosal also contains three semicircular canals in three perpendicular planes that act as an internal gyroscope and help the brain understand its location in space to maintain balance while walking or standing. I have reconstructed several ossicular chains as well as the inner ear (cochlea and semicircular canals), ectotympanic, and petrosal. I also worked to reconstruct a hyoid. The hyoid is a collection of bones unconnected from the rest of the skeletal system. It provides structure for bones around the lower jaw to attach to. Because these bones are small, fragile, and disconnected they are easily lost or broken which makes studying them challenging. Finding these bones in a fossil specimen is especially rare. To date (29 May 2016) I have published two papers in the Annals of the Carnegie Museum and on my work appeared on two posters displayed at the annual meeting of the Society of Vertebrate Paleontology.